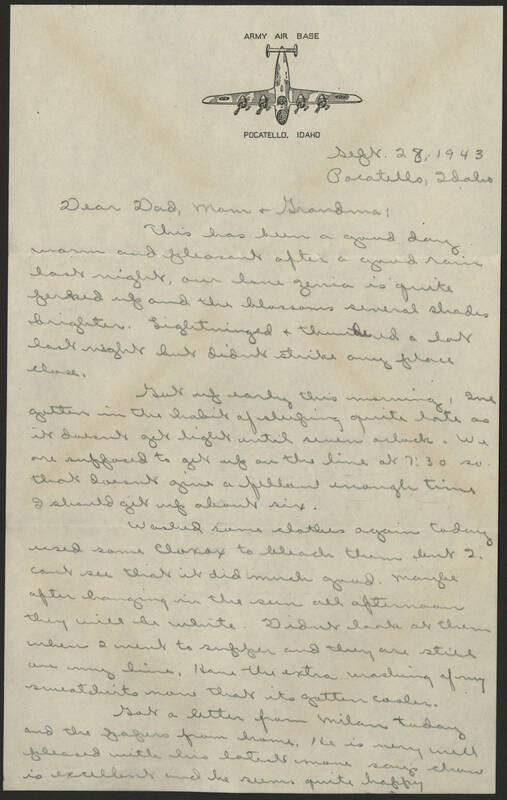 Sept 28, 1943 Poratello, Idaho Dear Dad, Mom, and Grandma: This has been a good day warm and pleasant after a good rain last night, our [illegible] yerria is quite ferked if and the [illegible] several shades brighter. Lighteninged and thundered a lot last night but didn't strike any [illegible] else. Was early this morning, I've gotten in the backside of [illegible] quite late as if doesn't get bright until seven o'clock. We are staggered to get up an the time at 7:30 so that doesn't give fellow enough time. I should get up already six. Washed some clothes again today used some clorxacx to bleach them 2. Cant see that it much good. Maybe after hanging in the sun all afternoon they will be white. 20 [illegible] land at them when 2 went to [illegible] and they are stide an my time. I have the extra washing of my [illegible] means that its gotten cooler. Got a letter from william today and the packages from home. It is very weird [illegible] with this letters home says charms is excellent and he seems quite happy.